GorillaDesk is a leading field service management software that delivers all the important features and tools pest control businesses, pool service businesses, lawn care companies, and other field service providers need in order for them run various aspects of their operations smoothly, complete their jobs and tasks faster, satisfy their customers, and achieve business growth. 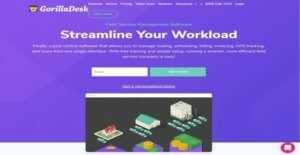 As an all-in-one field management software, GorillaDesk combines different solutions, capabilities, and features together, enabling users to save valuable time and concentrate more on growing their business. With GorillaDesk, they will be able to access information about their customers from any location and device, track devices and equipment that are deployed in the field through barcode scanning, monitor the precise locations of their team members on a map in real time, set and optimize routes, schedule and update appointments quickly, assign or route jobs using a drag-and-drop calendar, and track and report chemical and material usage and application. GorillaDesk also helps users communicate with their teams and clients effectively. They can send work order details, notes, and reminders to team members to keep them in the loop and ensure that they are able to accomplish their tasks on time and properly. When it comes to communicating with clients, the software gives them the ability to reach out to clients through automated SMS messaging. The field service management software, moreover, has a document management feature. Users can integrate custom documents into the software, attach documents to jobs, and enable electronic signing of documents. Last but not least, GorillaDesk supports integration with Stripe which permits users to process online payments fast as well as monitor past due balances easily. GorillaDesk offers a feature that enables field service providers to compete well and stay compliant with the regulations imposed by any state and requirements demanded by their clients. This feature is called device tracking. Some facilities require device tracking, so this feature is very useful for field service businesses and companies that are bidding on jobs that have such requirement. So how does this feature work? GorillaDesk allows users to attach barcodes to field-deployed traps devices, or equipment they want to track. They can scan these barcodes using a mobile application, enabling them to capture and store any relevant activities and findings such as device status and location, material usage, chemical application, inspection details, and more. They can track and manage all field-deployed devices directly from the mobile app as well as generate documents in which device data is included like invoices, work orders, and device reports. Another feature incorporated into GorillaDesk is scheduling. With this feature, users will be able to easily prepare schedules for jobs and appointments. Through the aid of a user-friendly calendar that has a drag-and-drop interface, they can intuitively create schedules, add all the important details they need, and assign job or appointment schedules to team members. They can also view schedules on a map. If they want to see the details associated with a particular schedule, all they need to do is to hover over the appointment or schedule which is pinned on the map. The software enables them to print schedules in PDF format directly from the calendar, too. If GorillaDesk allows users to view job and appointment schedules on a map, it also enables them to monitor the exact locations of their team members on a map in real time. This is made possible through the aid of the software’s GPS tracking feature. Basically, this feature makes it easy for them to verify if team members are currently located in places where they are supposed to be at and make sure that they are not wandering elsewhere. The GPS tracking feature is integrated into the software’s mobile application, and what’s great about this is that the app can even keep track of the actual routes team members took using such feature. Speaking of mobile app, GorillaDesk’s mobile application is very powerful because it extends the capabilities of the software to iOS and Android devices. Technicians and personnel dispatched in the field can actually take advantage of this app, as it permits them to perform tasks while they are on the go such as viewing schedules and appointments, viewing details about the jobs assigned to them, accessing documents, or preparing invoices and collecting payments. Any field service business requires documents like contracts, agreements, or state or government-related forms. Thanks to GorillaDesk’s document management feature which makes the process of handling any type of field service document seamless. GorillaDesk has a library of pre-built documents and forms that users can access by activating the document add-on. If they want to add a custom document or form to this library, GorillaDesk can also integrate that into its system. In addition, filling out these documents and forms with information is very simple. For example, when users are editing a particular document, they will be able to access two windows, one on the left and another on the right. The left window is the live preview of the document, while the right window is an area where they can type in information. As they enter information into data fields found in the right window, the document’s live preview is automatically populated with the information they typed in. What is more, the documents and forms can be signed electronically. Attaching documents and forms to jobs that are shown on the calendar is made possible as well. Users can preview the documents attached to jobs straight from the calendar. As previously pointed out, GorillaDesk combines different tools and solutions together. One of those tools and solutions is a built-in CRM or customer relationship management system. Users can utilize this CRM system to store, access, and update any information about the clients and customers they are providing services for. Moreover, the CRM system is mobile-friendly, allowing them to access customer information from their mobile devices anywhere. The field service management software comes with features that automate and enhance communications with team members and clients. Users can create and send notes to team members. For example, when they are preparing schedules and assigning jobs to team members, they can add notes and even upload and attach files. This way, team members are reminded of the things they need to consider as they perform their jobs. Another communication feature included in GorillaDesk is automated SMS messaging. Thus, with this feature, users and their clients can exchange text messages with each other, eliminating the need to make phone calls. To wrap it up, GorillaDesk integrates with Stripe, a leading and widely used online payment service. The main benefit users can get from this integration is it enables them to collect and process online payments fast. This integration feature lets them store debit and credit cards within the software which they can charge later on. They can also add links to the invoices and statements they are sending out to clients via email so the latter can make payments online quickly. If a client has a past due balance, a late payment reminder can be sent to him or her. Since each company has specific business needs, it is prudent for them to refrain from looking for a one-size-fits-all ideal software system. Needless to say, it would be useless to try to find such a platform even among popular software applications. The intelligent thing to do would be to catalog the various important factors that need consideration such as required features, finances, skill levels of workers, company size etc. Then, you should do your homework thoroughly. Read some GorillaDesk reviews and look into each of the other systems in your shortlist in detail. Such exhaustive research can make certain you reject ill-fitting platforms and zero in on the solution that provides all the features you need for business success. How Much Does GorillaDesk Cost? We realize that when you make a decision to buy Field Service Management Software - FSM it’s important not only to see how experts evaluate it in their reviews, but also to find out if the real people and companies that buy it are actually satisfied with the product. That’s why we’ve created our behavior-based Customer Satisfaction Algorithm™ that gathers customer reviews, comments and GorillaDesk reviews across a wide range of social media sites. The data is then presented in an easy to digest form showing how many people had positive and negative experience with GorillaDesk. With that information at hand you should be equipped to make an informed buying decision that you won’t regret. What are GorillaDesk pricing details? What integrations are available for GorillaDesk? If you need more information about GorillaDesk or you simply have a question let us know what you need and we’ll forward your request directly to the vendor.